Baccaro Construction Company is the premier home remodeling company servicing Orange County, LA County, and the Inland Empire. We specialize in room additions, kitchen, and bathroom remodeling. We are a design-and-build contractor with in-house designers to maintain the integrity of your project, from concept to completion. Baccaro Construction Co.,Inc. holds multiple licenses and certifications, enabling us to handle all phases of your home improvement project, giving you peace of mind your project will meet and exceed your expectations. Because of this, our team at Baccaro Construction is dedicated to providing you with the most suitable design for your home, completed by experienced and dependable craftsman. We are committed to maintaining our reputation and offer complete and unconditional customer satisfaction. Since 1959, Baccaro Construction Co., Inc. has offered high-quality residential design and remodeling services. 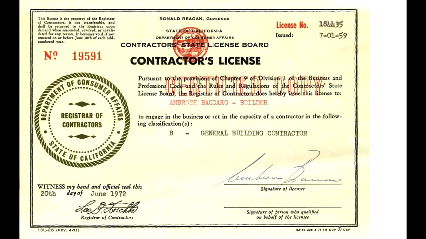 Baccaro Construction Co., Inc. is fully insured and licensed as a General Building Contractor (CA #422570), which means we have the expertise to see your project from concept to completion. We carry brands such as Furniture Guild, Crystal, Enkeboll designs and many more. 5 Star rated on Facebook, Houzz, Yelp, and Yahoo! Give us a call today at (714) 515-5690 for a free consultation!